Based on the book “Nim Chimpsky: The Chimp Who Would Be Human,” by Elizabeth Hess, PROJECT NIM is an unflinching and unsentimental biography of an animal that science tried to make human. What it reveals about his true nature – and humanity’s – is comic, revealing and profoundly unsettling. ​In 1973, at the Institute for Primate Studies in Oklahoma, a baby chimp is born. A few days later, his mother is knocked down by a tranquilizer, and her screaming baby seized and placed into the arms of a new human “mother.” Thus begins Project Nim, a university-funded experiment to show that a chimpanzee can learn to communicate with language if raised like a human. Under the auspices of Columbia psychology professor Herb Terrace, the chimp, Nim, is brought to NYC to live with Stephanie LaFarge, one of Terrace’s former students. ​Though LaFarge knows next to nothing about chimps, her bond with Nim is immediate, but the collateral damage on her home and family eventually becomes a problem. Displeased with Nim’s unstructured upbringing, Terrace enlists psychology student Laura Petitto to ferry Nim back and forth to a Columbia classroom and teach him sign language. Eventually, he moves Nim and Petitto to the Delafield Estate, a Riverdale mansion owned by Columbia. As Nim learns to communicate using dozens of signs, the media latches on to Nim’s story, resulting in a cover piece in New York magazine. ​As time passes, Nim grows stronger and his animal nature emerges. Though affectionate and playful, he also becomes aggressive and unpredictable. Having been bitten once too often by Nim and after briefly becoming romantically involved with Terrace, Petitto leaves Delafield, ceding control of Nim to Bill Tynan and Joyce Butler, who counters a Nim attack with a warning bite of her own. Renee Falitz, trained as an interpreter for the deaf, also works with Nim, but leaves after Nim savagely bites her in the face. ​Explaining, “Nobody keeps chimps more than five years,” Terrace decides to end the experiment, and returns a tranquilized Nim to the Institute for Primate Studies in Oklahoma, where the disoriented animal encounters other chimps for the first time since birth. Although the other chimps don’t understand sign language, Nim eventually adjusts to living with them under the supervision of IPS staffers Bob Ingersoll and Alyce Moore. 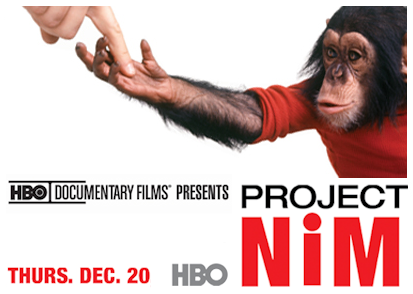 When the center runs out of funds a few years later, Nim and other chimps are sold to LEMSIP, an NYU research facility, where they are subjected to a series of lab experiments while living in small cages. Though he later condemns such research as inhumane, Dr. James Mahony supervises these experiments, drawing the ire of Ingersoll and other Nim caregivers. ​News of Nim’s predicament inspires a movement to free him. After lawyer Henry Herrmann suggests that Nim be given a day in court to testify on his own behalf using sign language, NYU sells the chimp to Cleveland Amory, an animal-rights activist who runs Black Beauty Ranch, a Texas sanctuary for abused, mostly hooved, animals. But with no chimps or human friends, Nim is isolated and lonely; he smashes a TV and accidentally kills a poodle in a fit of rage. When Stephanie LaFarge, his first human mother, reunites with Nim after almost 20 years, Nim immediately recognizes her and attacks when she unwisely enters his cage. Though shaken by the experience, LaFarge is relieved and grateful when Nim spares her life. When LEMSIP closes in 1995, Mahony moves a number of the facility’s chimps to more humane locations. Two of them, Mitch and Lulu, join Nim at Black Beauty, and his life and attitude improve. With old friend Bob Ingersoll often dropping by for visits, Nim lives for five more years before dying of a heart attack in May 2000. PROJECT NIM is directed by James Marsh; produced by Simon Chinn; editor, Jinx Godfrey; executive producers, John Battsek, Andrew Ruhemann, Jamie Laurenson, Nick Fraser and Hugo Grumbar; director of photography, Michael Simmonds; original music by Dickon Hinchliffe. For HBO Documentary Films: senior producer, Nancy Abraham; executive producer, Sheila Nevins.